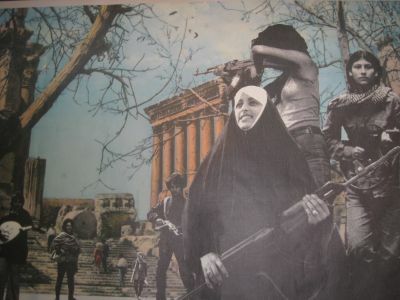 "The Lebanese civil war has cost 200,000 lives. But no one talks about it", says culture activist Alfred Tarazi. "If the war(s) in Lebanon were studied, the flows of funds used to finance the fighting would be unveiled." That is why, according to Tarazi, the Lebanese government has not initiated a debate about the war and a possible reconciliation. "So many parties have been involved that objective historiography is impossible. Each individual has experienced the war in a unique way. Which is why all the Lebanese do is stay silent." Tarazi hopes to end the silence with the project Silent Square. Together with his partners in the Feel Collective for Resisting The United States of America, he has designed a monument for the Martyr's Square in the centre of Beirut: 200,000 sticks each topped with a piece of red fabric and a red lamp will be positioned over the entire surface of the square. Each stick represents a victim. 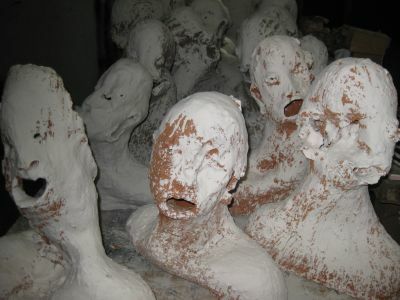 A slope that is 64 metres long runs into a deep hole: a hole filled with busts with faces grimacing from pain and fear of death, representing a mass grave. Black-and-white photographs of these faces are currently staring out from posters illegally plastered throughout the streets of Beirut. First and foremost, Silent Square is a concept. It includes a variety of projects that the Feel Collective has initiated outside of the regular gallery circuit. This year the collective has superimposed black-and-white photographs of the war on postcards picturing Beirut before the war. These collages have been blown up into posters and hung in public spaces. 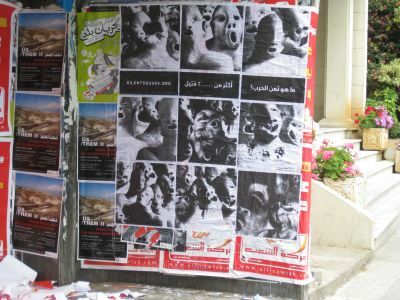 Due to the censure regulations, the various posters were removed. However, as Tarazi recently stated in an interview with the Daily Star: "This is part of the experimental process. We want to bring the debate on the past as far along as possible. It is my hope that this will eventually lead to a moment of truth."